Fashion Herald: Borders: Gone Forever? From the looks of this story in the Boston Globe, we all better get our Borders on soon. The Globe story predicts that Borders' possible extinction will hurt e-book sales, as readers still like to browse in-store before buying an e-book. The demise of Borders would affect 11,000 employees in about 400 stores, down from 1,249 stores in 2003. The 34th Street Borders, pictured, is located in a two-story space on the corner of 33rd and Seventh in Madison Square Garden. 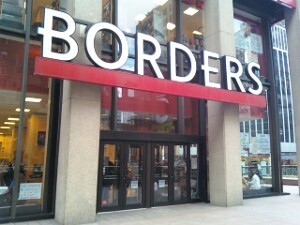 Are you sad to see Borders possibly exit the retail landscape? And do you browse the IRL copy before you buy digital? I don’t believe people will stop buying books because of e-readers, but obviously the outlets are changing. Me, I’m an old-school lover of books, but that doesn’t mean I don’t covet an iPad, especially after our last apartment move involving way too many boxes of books. Our future most likely will never again involve moving so many books. Instead I foresee a small collection of hardcover favorites, or the hiring of a moving company to save our lower backs. Now hopefully someone will jump in last minute, revamp the stores, and help save all those jobs.